I never challenged myself to make swiss rolls, although they are my favorite among cakes. This is because it looked so complicated and delicate to make. 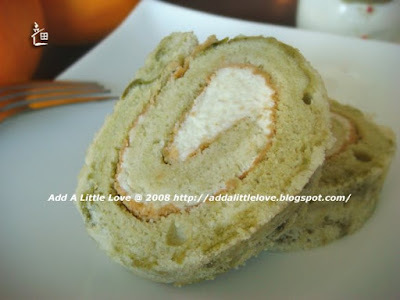 One day, I happened to see a recipe for "green tea" swiss roll. 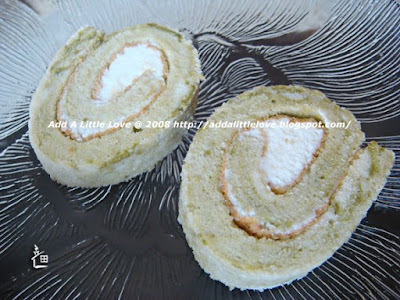 It sounds so exotic and delicious, and I never had green tea swiss roll before. So I ended up make those by myself. However when I really started making those, it appeared to me that the roll cake is not as half difficult as I imagined. It took less than two hours for me to make and to take many step-by-step pictures. 1. Pre-heat the oven, 325F. Sift flour. mix flour with baking powder, 1/4 cup of icing sugar, salt, water, oil, and vanilla extract. Stir well. 3. beat the egg white in a clean and dry bowl until the bubbles form. Add cream of tartar, and rest icing sugar slowly. Beat till the peak forms. 4. Take 1/3 egg white and mix it into the flour bowl, quickly stir it well.Take another 1/3 egg white and mix it into the flour bowl, fold slowly. Fold the rest egg white slowly. 5. In a small bowl, take some batter and add green tea powder, mix them well. And then pour it into the big batter bowl, roughly stir it, in order to make cloud shape. 6. Pour the batter into the baking tray covered with parchment paper, and put it into oven. Bake for 25 minutes, or tooth pick comes out clean. 7. Cool it down in the fridge for an hour. Cut off the edges. 8. Whip the whipping cream until it is ready. 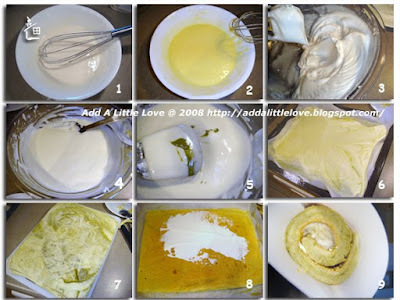 Spread whipped cream on the bottom side of the cake. 9. Gently roll up the cake, and keep it in the fridge. It is ready to serve.